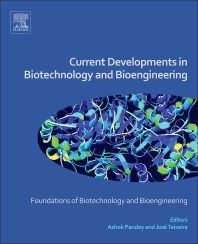 Current Developments in Biotechnology and Bioengineering: Foundations of Biotechnology and Bioengineering is a package of nine books that compile the latest ideas from across the entire arena of biotechnology and bioengineering. This volume focuses on the underlying principles of biochemistry, microbiology, fermentation technology, and chemical engineering as interdisciplinary themes, constructing the foundation of biotechnology and bioengineering. is a Full Professor and currently the Head of Biological Engineering Research Center (CEB) of the Engineering School of Minho University. CEB is responsible for scientific research and advanced formation in Biological and Chemical Engineering. He got a Chemical Engineering degree from University of Porto in 1980, place where he also obtained his PhD in 1988. Jose Teixeira research activities have been focused on two main topics: bioprocess development - bioreactor development and characterization; yeast physiology and bio-separation processes, bio-surfactants production for biomedical and MEOR applications; and food technology. He was scientific coordinator in 32 research projects, 7 of them EU financed, He was also the supervisor of 31 PhDs and 16 pos-doc researcher. He has authored 350 peer reviewed papers and is co-editor of the books “Reactores Biológicos-Fundamentos e Aplicações” (in Portuguese) and Engineering Aspects of Milk and Dairy Products.